Hiking or biking with a global positioning system receiver, or GPS, is a great way to spend a day at the forest. With a GPS receiver, you can watch your progress on a trail, record your tracks for posterity’s sake or to return to a favorite spot later, or even to plot wildlife sightings. A GPS receiver is really nothing more than a special radio that receives signals from a constellation of 24 satellites that are in constant motion around Earth. These satellites continuously transmit location data that can be received anywhere on Earth’s surface. A low-end receiver costs about $100, while high-end models cost hundreds and even thousands of dollars. But whether you have a $100 receiver or a $1,000 receiver, you will always be able to know the coordinates of your position, the direction you’re heading in, how fast you’re going, the distance you have traveled, your average speed, and even your estimated time of arrival to a programmed point. The receiver shown on this page is the Garmin Rino 120, which costs about $250. 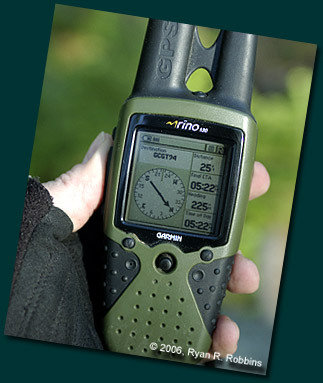 The Rino 120 is also a two-way radio that can transmit its location information to other Rino users. After a day at the forest recording your tracks and coordinates of interesting finds, you can go home and upload the data into a mapping program, such as DeLorme’s Topo USA. This is one of 13 City Forest caches listed at www.geocaching.com. Can you find it? Another fun way to enjoy the forest using GPS is geocaching. In essence, geocaching makes a sport of scavenger hunting, using the whole world as the game board. A players hides a “cache” and then tells others the coordinates of the cache, and even some clues that describe the terrain where the cache can be found. A cache is usually hidden in a weather-resistant container under rocks, under a log, or any place people or animals won’t be able to disturb it easily. The cache can include anything – marbles, baseball cards – and usually has a guest book so you can leave your name and the date and time you found the cache. If you take something from a cache, etiquette requires you to leave something in exchange. Sometimes a cache is “virtual,” and all you must do is go to the coordinates and take a photo of the surroundings and e-mail it to the cache leader. To search for caches in the Greater Bangor area, go to www.geocaching.com. 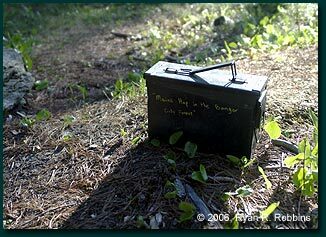 You and your friends can even have geocache competitions to see who can find the most caches the fastest. To save for importing into a DeLorme mapping program, such as Topo USA 6.0, right-click on the file you want and select "Save file as..."
GPX is an XML-based GPS conversion format that enables you to transfer data from one mapping program to another. To save, right-click on the file you want and select "Save file as..."